In my Projects, Projects, and More post I promised to write a post about the humming bird nectar I make. For the northern states this post is coming too late as most of the humming birds have or are about to migrate south. But for the southern states who have humming birds year round this is still relevant information. If you buy humming bird nectar, just stop. It is expensive, full of preservatives and dyes, and is super simple to make at home. Humming bird nectar consists of sugar and water. Nothing more is needed. In the past I have added red food coloring to the nectar but it really isn't needed because the humming bird feeders are red. Humming birds are of course attracted to the color red. 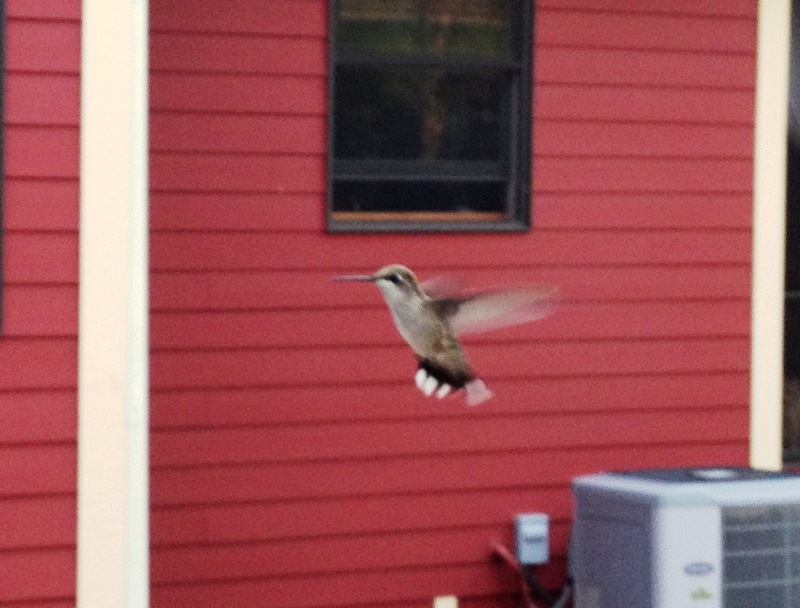 As you can see from the photo above, our house just sitting there attracts a lot of humming birds. Humming bird feeder and wasp trap. Usually I use 2 cups of water and 2/3 cups water. Heat the water to a boil then add the sugar, stir to dissolve. Let cool and use. Now heating the water is not so much about dissolving the sugar, although it does speed up the process. Heating the water is more about driving chlorine out of the water. If you use city water this is a big deal. If you have unbleached well water then it isn't. You can heat the water in a pan on the stove top or you can heat it in a microwave. I often use a 2-cup Pyrex measuring cup to heat the water to boiling. Usually I tell people to stay away from using the microwave as it destroys so much of the nutritional content of food. But in this case, heating water to boiling is exactly what a microwave does best (not to get technical but that is how it heats things up by stimulating the atomic bonds in water molecules). Remember humming birds are tiny little creatures. Anything extra in the water like dyes, preservatives, chlorine, fluoride can have a major impact on the health of our little friends. So keeping as little extra out of their nectar as possible should be your goal. Also, do not use a sugar substitute. Serious, the birds are drinking the nectar for its calorie content, they do not need to be on a diet. You need to change the nectar out and clean the inside of the feeder every day when the temperature is 90 degreed F or above. Every other day for 80 degrees or above. And at least once a week for temperatures in the 70s. Also change the nectar if the nectar gets fouled by bugs (wasps still find their way into the tiny opening of our feeder) or if you see any mold. Mold has a sever impact on a humming bird's ability to navigate so make sure your feeder is always clean inside and out. If you cannot get a mold stain out of the feeder, toss the feeder and get a new one. I make sugar water too, but I've been using more sugar in the ratio, is that bad? Hi Jeannie. I don't think that is bad at all. I find I get the sugar recrystallizing in the feeder openings when I use a higher sugar amount. Thanks for stopping by! I've never bought the artificial stuff! Hate all the preservatives :) Thanks for sharing your recipe on The Creative Home & Garden Hop...hope to see you again today!